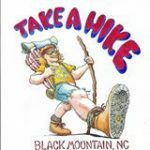 Take A Hike Mountain Outfitters is your complete gear store for camping, hiking, backpacking and more. Located at the corner of Sutton and Broadway, our store is a treasure trove of local trail maps & guides, Eno hammocks, boots, Smart Wool and Darn Tough socks, water bottles, and dehydrated foods, tents, sleeping bags, and day packs. We also offer a wide array of men’s and women’s casual wear and hats, including the largest selection of local area and Black Mountain T-shirts. Shop online at www.takeahikenc.com and enjoy free shipping on orders over $49.95. Or visit us in-store and find your favorite styles from Patagonia, Horny Toad, PrAna, Columbia, The North Face, and KAVU. Take a Hike Mountain Outfitters has been a local icon since 1999 offering exceptional customer service and great deals. Stop in next time you’re heading out to Take A Hike.